Rahul Dravid says he is looking forward to the New Zealand tour and doesn’t feel that his recent lack of form should be a cause of worry. “I have faced many challenges at the start of my career, while establishing myself and later on too. So, I don’t think there will be any extra pressure on me right now. I am taking everything as it goes and I will get my confidence back,” the classy Indian middle-order batsman told media on a private visit to the city here on Saturday. “Definitely, I am looking for a few important domestic games before the New Zealand tour and I have come here to train at the M.L. 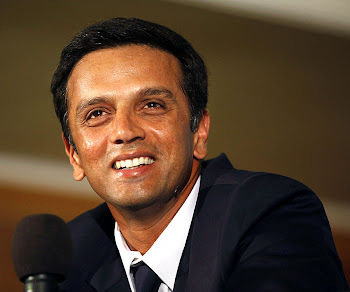 Jaisimha 365 Indoor Academy and to include a different perspective in my preparations,” Dravid said. “We have been doing well at the top level except for the Sri Lankan tour. So we hope to continue doing well,” he said. Dravid also said that too much of importance was being given to the latest ICC rankings and nowhere in the world would these things get so much space in the media as they get in India. “Perhaps, this is because there is not much international cricket right now featuring India. I don’t want to give too much importance to these rankings. Just forget them,” he said. Yeah I totally agree with Dravid here and tell others too when they criticize him. He had such a hard time winning people's love and he is in a similar phase now and doing exactly that. May God be with him, his fans are truly there to support him.